This is a diagram of a database that will be used in our example. As far as logic goes - we have an abstraction called ABSENCE that can be either a recursive absence (REC_ABSENCE) or a month recursive absence (MONTH_REC_ABSENCE). The recursive absence and the month recursive absence are differing from the absence in terms of data being held more than in terms of the behavior. Of course from the logical point of view, this example can have little sense but it is just an example so don't focus on the business side. Note that you do not have to explicitly create an id field. 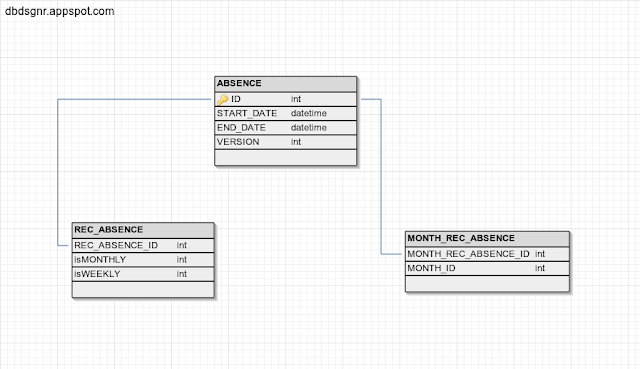 You define it by means of an annotation @PrimaryKeyJoinColumn with providing the name of the id column for the given entity (REC_ABSENCE_ID) and the name of the column for the id it is referencing (ID in the ABSENCE table). Issue with the referencing of the column name as in the previous example.